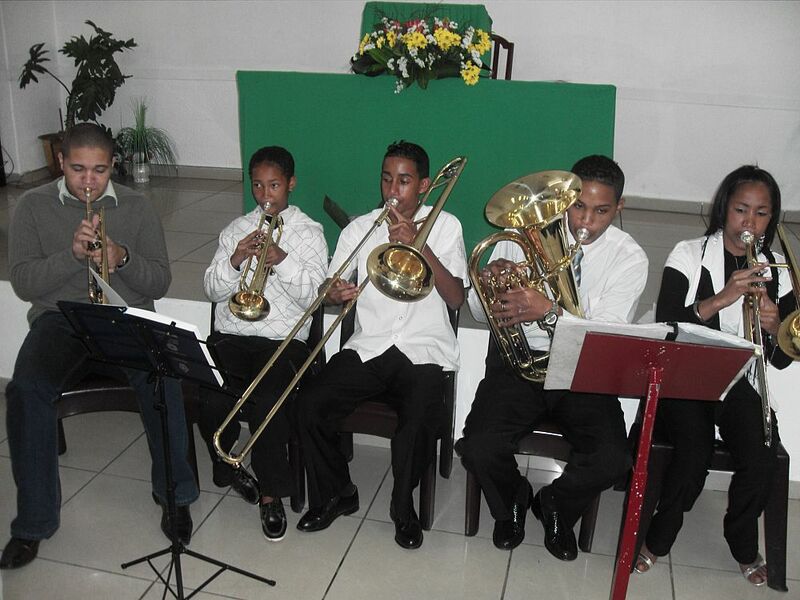 The seeds to start a brass band at El-Shaddai Moravian Church were sown when firstly a combined band from Arcadia, Bloemendal and Ebenhaeser visited in 2003, when the Clarkson band attended the 30th birthday celebration of the church as well as when the Salem Bands visited El-Shaddai in 2006. Br Martin Baatjes, a former band leader at Veeplaats and Ebenhaeser, was present during the 2003 visit. He and Gerald Barlow persuaded his daughter, Moira Daya, who was married and living in Johannesburg to join the congregation. 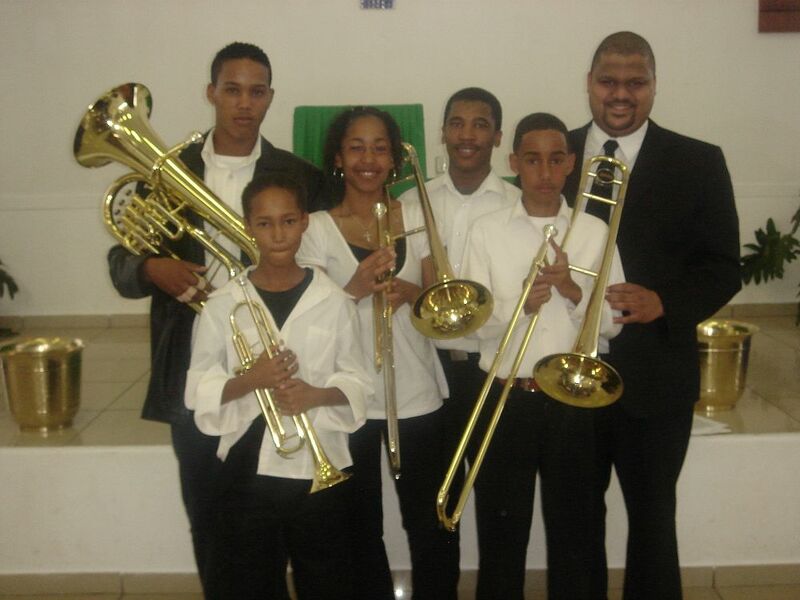 When Rev Wentzel, a former trumpeter from Clarkson was called to the congregation in 2004, Br Baatjes offered to spend some time in Johannesburg with his daughter and teach juniors if the congregation would buy some instruments. Br Baatjes had during his retirement continued to teach junior players at various congregations in Port Elizabeth. Sadly he did not live to see the day that instruments were bought at El-Shaddai. His daughter however, became very active in the music life of the congregation where she was appointed as organist and choir mistress. She also followed her father’s dream and became involved in the purchase of brass instruments with the support of Rev Wentzel. The Daya family kindly donated two trumpets. A much appreciated donation of a slide trombone was also received from Br Russell Jegels and family. In 2007, Felicia Lambert, from Ebenhaeser and a former executive member of BBSA, attended a course in Pretoria and started teaching beginners. In 2008 Bryce Wentzel, from Clarkson relocated to Johannesburg and took charge of the band. 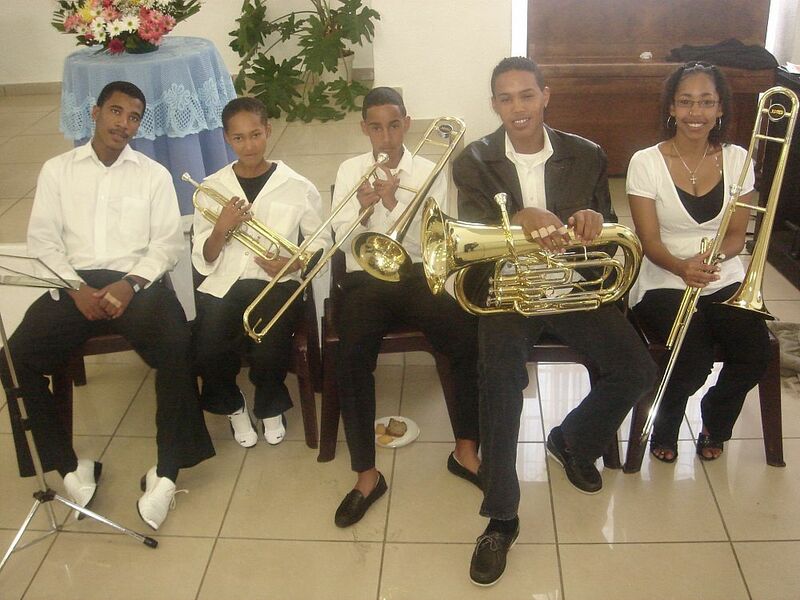 The band then held a week-long camp at the home of Sr Daya, where Alexander Hitzeroth, from Salem, worked with the young players and prepared them for their first performance on Jubilate Sunday, 13 April 2008. He wrote a special arrangement of Jubilate using only the notes that the beginners could play, with Bryce Wentzel on first trumpet. Alexander Hitzeroth was the conductor for the day and the beginners played Beautiful Brown Eyes on their own. During the June holidays the band held another week-long camp at what they called their "White House". They then performed at the Kinderfees Celebrations as well as at the Eldoradopark Ecumenical Service held on Kinderfees Day where they played Masiti and the other songs they played before. The band practice from 17h00 to 19h00 on a Thursday and from 09h00 to 11h00 on a Sunday. The arrival of Carlin Wicomb, from Lansdowne, and Michael-John October from Bridgetown added further impetus to the band. They work with the band on Sunday mornings whenever possible. El-Shaddai is thus now able to offer a home to all brass players from other congregations who come to work in and around Johannesburg.